What a fantastic week of celebrations aboard Jabberwocky this week! We started on Monday with a couple celebrating their 55th (yes 55th!) Wedding Anniversary. They described their day was one of their most memorable anniversaries and they had 55 to choose from! Photo recapping A 55th Wedding Anniversary Celebration! Tuesday saw Phil's celebrating his 50th Birthday with wife and friends. Lunch and lots of fun trying to sychronise simultaneously jumping off the boat in Carlisle Bay. Photo recapping Phil's 50th Birthday Celebration! For Wednesday a gang of friends joined Hannah to celebrate her birthday and although a lady never discloses her age the cake did have 5 candles- to celebrate decades not years! And with champagne to help round off the day she was celebrating in style Thursday's charter was a suprise wedding present from some of the family for Jason and Sharon who had got married on the island a few days earlier . A romantic day just for the two of them - although we think the family looked quite ready to join them aboard Jabberwocky as they waved us off. Photo recapping a wedding present - A romantic day for 2 on Jabberwocky what a great idea! And to finish this perfect week? 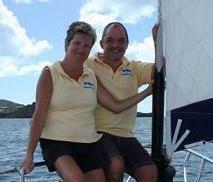 On Friday an American couple joined Jabberwocky to celebrate their 25th Wedding Anniversay . A suprise for Jacqui, the smile on her face told Ted he had made exactly the right chioce. Whatever the occasion a trip on Jabberwocky is a GREAT way to celeberate - just look at the photographs! CONGRATULATIONS to all those who celebrated their birthdays, wedding or anniversaries this week and especially to the families and friends who were clever enough to chose a trip aboard Jabberwocky as the perfect way to celebrate the occasion.